The moments I’ve had with the artists whose music makes up this new project have been sacred… undoubtedly. It is key to note that these sacred moments have, for the most part, taken place outside of the boundaries of the christian marketplace and the ‘area’ generally reserved for the the activity of God. These artists and their songs have been central to the necessary undoing of the expectations and limitations I habitually place on God; expectations of how, where and through whom God is revealed. I recognize God in their art and I believe it is a duty, as an artist and a christian, to point Him out where He is and celebrate Him there. from Justin McRoberts' Blog. Christian music didn't really have a place in my life until I was in college. I don't mean that I didn't listen to it, I went to my share of Petra concerts at Six Flags and the like when I was young, but the music I was passionate about, the music I loved and obsessed over was not a part of the Christian music scene at all. I went to a small Christian college in the south fully armed with my Cure, Depeche Mode, The Smiths, Sarah McLachlan cds, etc. That was the music I loved. During my first few weeks at college I remember getting into a very intense conversation with a new friend about Christian music. I didn't really see why I should listen to it. I think I probably made the standard complaints. I don't like it. The lyrics don't feel anything like my life. It's boring. (with a few exceptions. I liked Jars of Clay, I think and maybe a few others) She, of course, argued for it, how good it was, etc. It was this very friend who eventually introduced me to the music of Justin McRoberts. I can remember resisting at first and then suddenly--listening. Really listening. And that was that. I haven't missed a single album of his since. Now we live in a very interactive age where it's much easier to keep up with an indie artist with wonderful things like Twitter! So when I saw that Justin was getting ready to release a covers album, I got excited. When I saw the songs, I thought...of course. It just made sense in a way I can't explain that so many of these songs that are so much a part of the fabric of my own musical life would be on a covers album by one of the artists that makes faith influenced music I enjoy. Let me make two things clear from the start. 1) You do not need to be a Christian to appreciate how awesome this album is. 2) If you are a Christian you will appreciate how awesome this album is even though these aren't songs you'll find on the Christian radio station. Covers of much beloved songs are always tough. Will they sound different enough? Will they bring new interpretations to the music and meaning of the song? I think there's a lot of value in it, you can often hear something new in a song presented in a slightly different way. And that's what you'll find here. You will find fresh, beautiful, inspiring versions of songs you may be very familiar with. "Head Like a Hole" is a shot of pure genius, transforming the hard edged Nine Inch Nails song into a haunting song. My favorite track is number 4, "Fly From Heaven" The original Toad the Wet Sprocket song is lovely, but Justin has transformed it into this achingly gorgeous number I just can't seem to stop listening to. And naturally I love "Stripped" and "Please, please, please let me get what I want" I think these are the two I would be harder on than any other, and they pass. In short, I think this one is worth your time. It's a work that I appreciate on many levels. I appreciate it for its sheer enjoyability, but also for what it means. For the meaning it has in the life of one my favorite artists and for the meaning he wishes to convey. If we would but listen to the world around us, I think we see God has no limits in how He chooses to reveal Himself. 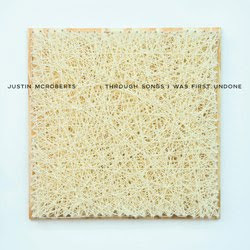 Please visit Justin McRoberts' website to learn how you can order this CD and all of his other music, too.